Blend of local cultures and tribes people including the Masai etc. Elephant,Buffallo, Gazelle, dikdik, Giraffe, Lion, Ostrich, Cheetah, Warthog, Flamingoes, Pelicans etc. Great Lakes, Beach, Bush Kenyan safari is the real deal. Whatever your tastes and interests, be it the cities, the wilderness, the flora and fauna or the sandy white beaches of East Africa, Seven Wonders Safaris will find the perfect holiday or business travel package for you in either the popular or lesser-known locations in the region. We offer adventure and activity, peace and serenity, beach and country, cultural and sporting safaris, and all this at many different types of accommodation at pocket friendly prices. Great Lakes, Beach, Bush Kenyan safari is one of the best of Kenya safaris you can bank on with high peaks ,big game, sandy beaches with first class accommodation and services as a priority leaving with treasurable lasting memories of Africa at close. For those wanting to experience Kenya’s most iconic national parks with a little beach relaxation at the end of their trip, the Bush to Beach Safari is the perfect itinerary. Visiting Masai Mara, Lake Nakuru, Lake Naivasha, and Amboseli, the safari portion of the trip ensures that you’re getting the very best of the wildlife experiences that Kenya has to offer. You’ll then finish your trip with a few days of rest & relaxation on the beautiful beaches of Mombasa. Jamboree Africa Tours and Safaris Team is happy to welcome you to Africa and sample our other Kenya safari options. Pick up from hotel or airport and depart from Nairobi via the Great Rift Valley to Masai Mara Game Reserve arriving in time for lunch at campsite. Late afternoon proceed for game drive in search of black maned lion, elephant, leopard and cheetah, buffalo and other plains game. Return to the camp for dinner and overnight. After breakfast depart for Lake Naivasha with optional boat rides. Lunch will be served at campsite/budget hotel then proceed to Hells Gate National Park where you will have a chance to walk among the wild. Return to campsite/budget hotel for dinner and overnight. Dinner and overnight at Lake Naivasha Carnelley Tented Camp, (Full Board). After breakfast, depart for Lake Bogoria where you will visit the hot geysers and have lunch before you proceed to Lake Baringo for optional boat rides followed by dinner and overnight at campsite. After breakfast depart for Lake Nakuru arriving in time for lunch and late afternoon proceed for game drive giving you a chance to see large flocks of flamingos, rhino, giraffe among other wild. Return to campsite/budget hotel for dinner and overnight. After breakfast depart for Samburu via the Thompson’s falls where you will have a stop over. You will arrive in time for lunch at your campsite and late afternoon proceed for game drive. Return to campsite for dinner and overnight. Full day game viewing with a chance to see the Grevy’s Zebra, Reticulated giraffe, long necked ngerenuk, somali ostrich among other wild. All meals served and overnight at the campsite. After breakfast depart for Mt. Kenya region arriving in time for lunch at campsite/budget hotel. Afternoon proceed for a visit to the “Mau Mau” caves before returning to campsite/budget hotel for dinner and overnight. After breakfast depart for Amboseli arriving in time for lunch at campsite. Late afternoon proceed for game drive in search of gigantic elephants the park is famous for not forgetting the views of Mt. Kilimanjaro. Return to campsite for dinner and overnight. Full day game drive with chances of seeing Mt. Kilimanjaro on a clear day.All meals served and overnight at campsite. After breakfast depart for Tsavo west where you will visit the mzima springs with achance to see hippo . Arrive in time for lunch at campsite followed by late afternoon game drive before returning to campsite for dinner and overnight. After breakfast proceed to Tsavo East giving you a chance to see the vast herds of dust-red elephants. You will arrive in time for lunch at campsite and late afternoon proceed for game drive then return to campsite for dinner and overnight. After breakfast proceed for a game enroute as you depart for Mombasa. The accommodation is half board in island Hotel or similar.Full day spend to tour and explore the beach and the island, relax, and shopping. HAVE A WONDERFUL TOUR – SEE YOU ON THE ROAD……. Meals:All meals noted in the itinerary. Each day generally includes Breakfast, Lunch, and Dinner buffets consisting of both western and local dishes. Transport: Transportation in standard game viewing safari vehicle complete with pop-up roof for easy viewing and photography. Sitting Pattern: Every passenger is guaranteed a window seat. 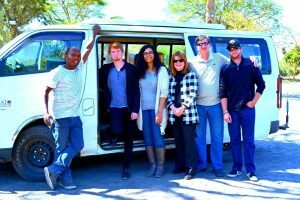 Driver/ Guide: Your driver/guide speaks English and has in-depth knowledge of the flora, fauna, landscape, and Kenyan culture safaris. Vehicle: A minivan outfitted with two-way, long range high frequency radio communications equipment. 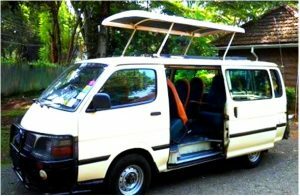 Accessories: Each 4x4 Toyota Hiace minivan carries safari accessories including window sills, a first-aid kit, an ice-chest, and a fire extinguisher. Water: Bottled mineral water during game drives. Park Fees: Park entrance fees and game drives as noted in the itinerary. Transfers: Pick up and drop off transfers. International Flights: International airfares and departures taxes. Personal Expenses: Personal communications charges for telephone calls, faxes, email, etc. Tips:: Tips and gratuities for your driver/guide. Extra Meals:Between meal snacks, parks, attractions, and events not included in your itinerary. Balloon Safari:Balloon safari in Maasai Mara (USD$420)per ride. Game Drives at night:Night game drive ($150 per person).